This week was a week full of excitement, it was our new Divemaster intern “Starfish” first week here, and I had 3 new PADI Open water students to teach, the week went by really quickly. We went off to Abades with Esther, Stephen and Jacob for their first ever dives on their PADI Open water diver course, they all had a great time and were excited to head off to finish their course the next day at Radazul. So excited were they that they booked to complete a couple of fun dives too. Then I had fun as Katie and Ian were back with Katies friend Heather for her PADI Discover Scuba Diving experince (DSD). Heather did excellently and we hope that she will get to complete more dives in the future. It was a really good week filled with nice people and fantastic dives. Although I still have over a month left, I can’t help but think my time here is almost up. Time has been flying by, mixing all the days and weeks together. But still every day there is something new to enjoy, a new student, and new intern, or maybe even a new dive site. Im looking forward to my last couple of months here in Tenerife with Dive and Sea. 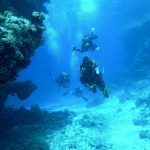 Tagged: Discover Scuba Diving, Discover Scuba DIving Tenerife, Dive and Sea Tenerife, Diving Tenerife, DSD, PADI Divemaster internship Tenerife, PADI Open water, PADI Open Water Tenerife. ‹ I am so close only a few more items to complete and I will be a Divemaster!! !